Aventúrate fuera del circuito turístico y descubre el lado secreto de Venecia en este recorrido a pie de 1.15 horas. Pasee por los tranquilos caminos de los canales y eche un vistazo a la vida local mientras explora los vibrantes vecindarios de Venecia. En el camino, deténgase para tomar fotos del Puente de Rialto, admire la Bovolo Staircase y el teatro La Fenice, y observe los animados bacaris (bares locales). Explore fuera del circuito turístico con un guía local. Introducción ideal a Venecia para los visitantes por primera vez. Such a great tour and our guide was so fun. She was kind and helpful with getting around. Tour had no real impetous. Guide was an older gentleman who ambled along paying little attention to whether our group was keeping up with him or not. Despite the headsets it was often difficult to make out what he was saying. 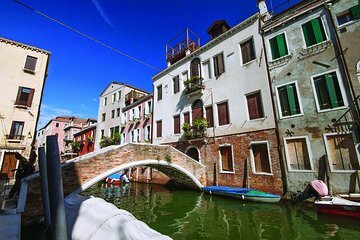 The big pluses on the tour were the fact that we were taken to spot with best view of Rialto Bridge and being taken to the Bovolo staircase. We had already wandererd past the square where the staircase is situated several times with no clue that we were just seconds away from such a stunning site. Guide was a little dry but very informative...maybe too much information. Big group and even though we had individual headsets it was at times difficult to hear.